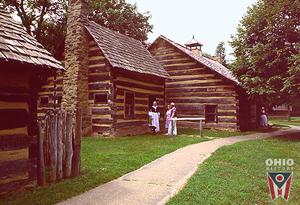 In 1772, David Zeisberger, a missionary of the Moravian Church, established the village of Schoenbrunn on the Tuscarawas River, near present-day New Philadelphia. The word Schoenbrunn means "beautiful spring" in German. The purpose of this community was to provide Moravian missionaries a place to teach Christianity to Native Americans residing in Ohio. At its greatest size, Schoenbrunn had a population of four hundred Christian natives, mostly Delaware Indians, and more than sixty buildings, including the first school and Christian church built in Ohio. At Schoenbrunn, the Moravians required the natives to abandon most of their traditional religious beliefs and customs. Each male native worked either in the fields or in a skilled occupation. Women were responsible for the care of the home and their families as in European society. Once their charges accepted Christianity as the true faith, the Moravians gave each native a new Christian name. The converts had to practice the European custom of monogamous marriage. They also could not question the dictates of Christianity or the orders of the missionaries. All converts had to live in Schoenbrunn to prevent the natives from lapsing back to their traditional beliefs. The natives could no longer engage in violence and had to forsake all customs associated with warfare, including shaving their heads, painting their faces, and wearing scalp locks. Native children attended schools designed to provide them with instruction in both English and the missionaries' religious beliefs. By requiring these rules of the Christian natives, the Moravians drove a wedge between those Delawares who converted and those who did not. Despite this, Schoenbrunn prospered, and the Moravians established new communities at Gnadenhutten and Lichtenau to accommodate additional converts. During the American Revolution, the Moravians and their converts hoped to remain neutral, yet both the English and the Americans refused to trust them. Facing harassment from both sides, Zeisberger and his followers abandoned Schoenbrunn in early 1778. They held a final service in the church, after which they tore down their house of worship to prevent its desecration. At this time, most of the Moravians and their wards relocated to Lichtenau. In late 1778 or early 1779, the Moravians briefly reoccupied Schoenbrunn, but continuing threats from American forces prompted the Moravians to abandon permanently this village and resettle along the Sandusky River in 1781.